The smallest, lightest, most flexible and the most comfortable Foot Drop brace. You will know, but very few will notice you are wearing the The Dorsi-Strap. And your gait and step off will be near normal! The Dorsi-Strap will reduce the risk of tripping and falling due to foot drop. No special shooes are required - you will be able to wear your regular shoes. The Dorsi-Strap is easilly applied, adjusted, removed or transferred to other shoes. No special devices need be placed into your shoes. And, it is lightweight - only 3 ounces so it won't weight you down. The ultra low profile of the Dorsi-Strap is enhanced by the available in black, brown or white to match your shoes. No impressions need to be taken, no customization, and no waiting! The components are flexible and durable - and washable too! 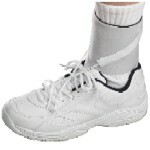 Note: The Dorsi-Strap provides only dorsi-flexion support for the foot. If any medical condition other than footdrop exists, get your physician's or therapist's approval prior to using the Dorsi-Strap. Available in two models the standard and the Pro. The standard Dorsi-Strap lets your enjoy comfortable, natural walking in street shoes. The tougher Pro Dorsi-Strap supports more vigorous activities such as hiking, jogging, golf, etc. The Leg Lifter Deluxre allows the user stree freemovement and placement of their leg. 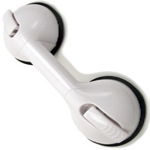 Place this grab bar where it is needed and you can take it with you when you travel. A self powered lifting cusion that will raise and lower you gently from your chair.